All in all, the performance of the PALFINGER Group was marked by steep growth in 2015. Revenue rose by 15.7 per cent from EUR 1,063.4 million in 2014 to EUR 1,229.9 million. This is a new record level. EBIT showed an extraordinarily strong increase of 58.0 per cent from EUR 66.1 million in the previous year to EUR 104.4 million, which is also a new record. The EBIT margin rose from 6.2 per cent in the previous year to 8.5 per cent. The consolidated net result for 2015 was EUR 64.4 million, 68.7 per cent higher than the previous year’s figure. “The PALFINGER Group achieved these record results in a difficult and volatile environment, which shows that the consistent implementation of our corporate strategy has borne fruit and put us in an excellent competitive position. We have adjusted our product range to the requirements of each market region, and we have become more flexible in production, which we are increasingly outsourcing to the market regions,” explains Herbert Ortner, CEO of PALFINGER AG, commenting on the satisfactory development of revenue and earnings. The major factors accounting for this positive performance included the huge gains achieved in the sale of loader cranes in Europe as well as the substantial progress made by PALFINGER outside Europe. In the USA, the favourable economy coupled with the stronger US dollar facilitated a significant boost in revenue and earnings. In Russia/CIS, the strategic investments in local value creation proved their worth, enabling PALFINGER’s soaring success in this market region. In Asia, PALFINGER’s cooperation with SANY was fruitful. In the marine business, the low oil price dampened customers’ willingness to invest; nevertheless, PALFINGER continued its growth, achieving an increase in revenue of approx. 26 per cent. In South America, however, PALFINGER recorded further losses in revenue as a result of the generally slack economy and the highly augmented reluctance to invest, even though PALFINGER’s share in this declining market increased. The contributions to earnings made by both segments showed a significant increase in the 2015 financial year. The loader crane business in the EMEA region posted marked increases in sales and revenue, which were also reflected in improved earnings. In timber and recycling cranes, sales rose again in 2015 compared to the strong previous year. In access platforms, a substantial year-on-year increase in revenue was recorded. Palfinger Platforms Italy, the joint venture in Italy focussing on compact platforms for small trucks, expanded its market position further. Demand for tail lifts remained more or less as weak as in the previous year. In hooklifts, new products enabled PALFINGER to record modest growth despite the difficult market environment. Following a considerable increase in 2014, railway systems revenue rose again in 2015, by approx. 30 per cent. Business with these complex systems for building and maintaining railway infrastructure is trendsetting for PALFINGER in terms of innovation and technological development. The capacity utilization of the production units was high as well. In 2015, the management’s main priority was to enhance flexibility. PALFINGER plans to build additional production halls at the Bulgarian site Cherven Brjag in order to benefit from the high productivity and low wage costs of this site. In the global marine business, PALFINGER increased its revenue by around 26 per cent year on year. This growth was enabled not only by the NDM Group (Norwegian Deck Machinery AS) acquired in the first quarter of 2015 but also by the market success achieved by Launch & Recovery Systems, Offshore, and Rope Access, a unit operating under the name of Megarme Group. In North America, PALFINGER recorded an increase in revenue of more than 29 per cent, approx. one-third of which was the result of organic growth and approx. two-thirds of which were due to the appreciation of the US dollar. As compared to the previous year, the product areas established on the market, namely Loader Cranes, Timber and Recycling Cranes, Tail Lifts, Hooklifts and Access Platforms, recorded significant increases in sales, which were also reflected in earnings. In early July, PALFINGER and Fairwind Holdings LLC founded the joint venture company FairWind Renewable Energy Services LLC, Lawton, USA, in which PALFINGER holds a 51 per cent interest. The new company specializes in the servicing of wind energy plants. In South America, the weak economy caused a contraction of PALFINGER’s business volume by around 35 per cent, but PALFINGER succeeded in expanding its market shares despite declining sales. In Russia/CIS, PALFINGER achieved an increase in revenue and managed to expand its market shares even though the market was affected by the economic sanctions and the weak ruble. Sales of PALFINGER’s locally produced products more than compensated the lack of exports to this region. PM-Group Lifting Machines, which had been acquired in the fourth quarter of 2014, was the main contributor to this development, but INMAN also posted significantly higher revenue. The expansion of production capacities at INMAN was completed. In March 2015, the two joint ventures, as agreed upon by PALFINGER and the leading Russian truck producer KAMAZ, were approved by the authorities and operations were started. One of these joint ventures produces truck bodies and mounts cranes, hooklifts and other lifting equipment on commercial vehicles, while the other joint venture produces cylinders for PALFINGER in CIS and for KAMAZ. The development of the Asia and Pacific market region was marked primarily by PALFINGER’s successful cooperation with SANY. Deliveries from the new plant in Rudong, north of Shanghai, were stepped up continuously in the 2015 financial year. The local production of hooklifts was also relocated from Shenzhen to Rudong. In the 2015 financial year, the EUROPEAN UNITS segment reported revenue of EUR 833.8 million, accounting for 67.8 per cent of the Group’s total revenue. This increase of 15.7 per cent as compared to the previous year’s revenue of EUR 720.3 million was due, on the one hand, to a substantial recovery of demand in Europe and, on the other hand, to the growth of the marine business. At EUR 107.0 million, the segment’s EBIT was higher than in 2014, when it amounted to EUR 75.0 million. 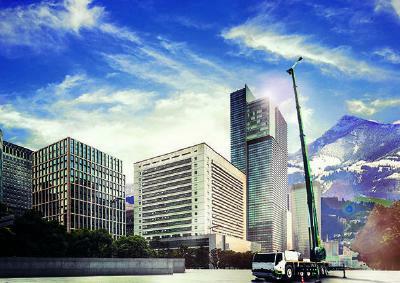 Revenue generated by the AREA UNITS segment increased by 15.5 per cent, from EUR 343.1 million in the 2014 financial year to EUR 396.1 million in the reporting period. Consequently, areas outside Europe now account for 32.2 per cent of consolidated revenue. Organic growth accounted for one half of this increase, while the other half was attributable primarily to the companies acquired in Russia. The segment’s EBIT rose by 40.0 per cent, from EUR 10.0 million in 2014 to EUR 14.0 million. An operational one-off effect was recorded, namely an impairment loss of approx. EUR 5.0 million on current assets in North America. Following the great number of strategic acquisitions made in recent years, the focus in the VENTURES unit was on consolidating the structures and integrating the new units. The EBIT posted by the VENTURES unit improved to –EUR 16.0 million (2014: –EUR 19.0 million). 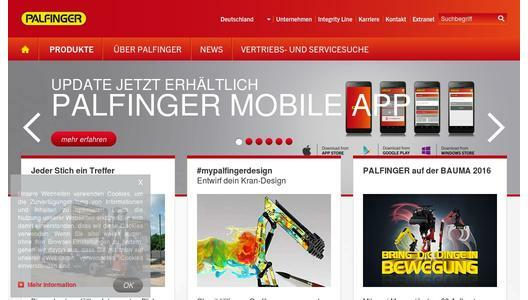 PALFINGER plans to continue its growth. By 2017, the Group’s revenue, including the joint venture companies, is intended to reach EUR 1.8 billion, through organic and inorganic growth. The fact that the global economy is still heterogeneous and volatile confirms the importance of the three strategic pillars of the PALFINGER Group. Without internationalization, innovation and flexibility, the continuous growth recorded by the Group would not have been possible. PALFINGER will therefore continue to pursue its long-term group strategy. Special attention is currently being paid to increasing the flexibility of all business units of the Group, particularly in the companies acquired recently. In the future, dealing with the impacts of digitization along the entire value creation chain will be a crucial competitive factor. Under the heading of “Industry 4.0”, teams from all areas of the Group are currently developing innovations in order to expand PALFINGER’s competitive position through smart products and solutions as well as processes adjusted to digitization. The foreseeable consequences of digitization will also be included in the corporate strategic planning for the period until 2021, which will be completed by the autumn of 2016. For 2016, the management expects a continuation of high volatilities, both in economic developments and on the currency markets. Sudden political tensions cannot be ruled out, either. As in the previous year, visibility at the beginning of the year ranged between two and four months; the current level of orders is satisfactory. “From today’s point of view, there are no indications that the PALFINGER Group will not be able to continue its growth strategy,” states CEO Herbert Ortner. In line with PALFINGER’s longstanding dividend policy, approx. one-third of the net result for the period will be distributed to the shareholders. Given that an interim dividend of EUR 0.18 per share was paid out on 21 December 2015, the Management Board is going to propose to the Annual General Meeting that the remainder of the annual dividend be distributed in the amount of EUR 0.39 per share. Hence, subject to the resolution to be adopted by the Annual General Meeting, a total dividend of EUR 0.57 per share (2014: EUR 0.34 per share) will be distributed for the 2015 financial year. Due to PALFINGER’s active sustainability management over many years, energy consumption in relation to revenue decreased from 91.6 per cent in 2014 to 87.4 per cent in 2015 and greenhouse gas emissions in relation to revenue went down to 89.0 per cent from 91.9 per cent in the previous year. Average net working capital relative to revenue decreased due to targeted measures to improve the key ratio of current capital, paying special attention to inventories, accounts receivable and accounts payable. At 14.6 per cent, this indicator was at a lower level than in 2014, when it came to 16.4 per cent. Equity increased by 12.3 per cent from EUR 454.7 million to EUR 510.7 million. This was primarily due to the positive result after income tax, which amounted to EUR 71.6 million. The equity ratio came to 42.1 per cent (previous year: 40.5 per cent). The decrease in current financial liabilities brought down net debt. As a consequence, the gearing ratio improved from 78.4 per cent on the 2014 reporting date to 68.1 per cent as at 31 December 2015. In the 2015 financial year, cash flows from operating activities amounted to EUR 110.6 million, compared to EUR 47.2 million in the previous year. Cash flows from investing activities changed from –EUR 217.4 million in 2014 to –EUR 64.6 million in 2015, which was primarily due to the lower acquisition volume. The described effects arising from the cash flows from operating activities and investing activities resulted in positive free cash flows of EUR 54.7 million in the 2015 financial year, as compared to –EUR 159.5 million in 2014. Value-creation indicators also developed well: Return on equity rose from 10.5 per cent at the end of 2014 to 14.8 per cent as at 31 December 2015, return on capital employed increased from 7.4 per cent to 9.6 per cent, and the weighted average cost of capital (WACC) remained at the same level as in the previous year, coming to 6.5 per cent. These developments resulted in a clear increase in economic value added, from EUR 6.7 million in the previous year to EUR 25.9 million. For many years PALFINGER has been one of the world's leading manufacturers of innovative lifting solutions for use on commercial vehicles and in the maritime field. As a multinational group headquartered in Salzburg, the Company, which has approx. 8,995 employees, generated total sales of approx. EUR 1,229.9 million in 2015. The Group has production and assembly facilities in Europe, in North and South America, as well as in Asia. The pillars of corporate strategy comprise innovation and the further internationalization as well as the growing flexibility of products, services and processes. PALFINGER is regarded not only as the market leader, but also the technology leader, in the global market for hydraulic loader cranes. PALFINGER is always in proximity to its customers due to its over 5,000 sales and services centres located in over 130 countries across all continents.